More often than not, doctors are an authority figure in the minds of millions. An image of importance (white coat, swift walk, stethoscope, M.D.) so successful in creating reverence, it is constantly used to shape minds through television programming. Respect the authority. But they aren’t the highest authority. If they were, it wouldn’t matter what they say. All would be Gospel. Or, people could simply choose which book they want themselves to adhere. Proof of this could not be more obvious then in the cases of not only Dr. Sherri Tenpenny who was forced to cancel her Australian tour after the loving, caring pro-vaccine camp resorted to threats of violence – but also, Dr. Jack Wolfson, “the Paleo cardiologist” who was recently vocal about not vaccinating children. In a very obvious and full-throttle move, the Arizona Medical Board is now investigating the doctor for what he said. At the same time, there are calls from “experts” to have such doctors’ licenses revoked because somehow, they are creating harm. 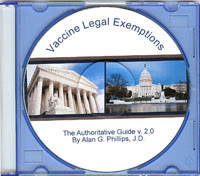 When has a doctor’s right to not use vaccines ever been negotiable? He/she chooses the treatment. Since when is expressing opinion grounds for having a medical license revoked? Lest we forget, vaccine use is an invasive medical procedure. It is also a commercial product from a private company even if only doctors are licensed to use them. Still a product. Still a procedure. Still a consumer. Still a body. If something’s wrong with the monopoly’s product, that should be all the more reason to refuse, or at least question, instead of being shut up, called names, labeled politically and segregated. This also means the doctor has the right to refuse using the product, just as they are not forced into using one medicine for all ailments, or surgery for headaches. No right to refuse for the one who went to med school? Big red flag. Gaslighting the public and placing blame on the possible “spreaders of disease” and using more force in revoking health freedom, will not bode well even if millions of lemmings come forth to squawk in unison. This egregious and outrageous campaign of mass hysterical proportions is in the measure gauge phase, set for things to come. Part of it includes making examples of doctors and nurses forced to wear scarlet letters masks if they don’t play along. If they succeed in that, they can scare other doctors and nurses into acquiescence. No matter what, you can’t be allowed to realize your own power or be anything other than a downloader of their message. If your doctor empowers you toward healing, they’ll get squashed! Hunted. Revoked. Humiliated. Shamed. Falsely accused. An ancient recipe with modern tools. Dr. Sherri Tenpenny and Dr. Jack Wolfson are indeed modern day targets for an old fashioned witch hunt – or else, why would words be a problem? The first casualty is expression for them, for you, for all the victims of deception or downloaded, doled out beliefs.